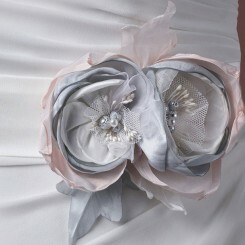 Wedding Belts and Sashes are a wonderful way to personalize your wedding dress and make it your own! 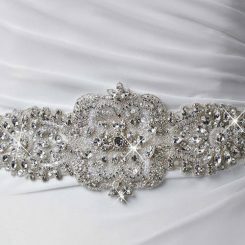 If you have chosen a plainer gown and have a “blank canvas”, as it were, the sky is the limit and you can embellish with a twinkling crystal wedding belt if you fancy adding a bit of sparkle. 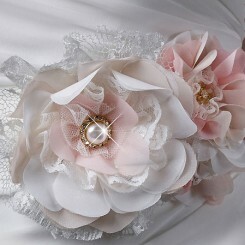 Or how about adding a feminine flourish with a romantic floral corsage bridal sash. 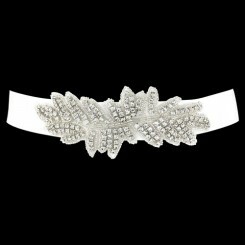 Wedding belts and sashes are not just for plainer gowns, however. 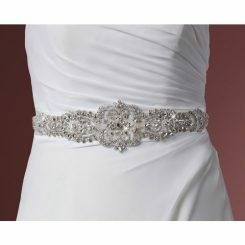 Even a wedding dress which is already beaded or otherwise decorated can benefit from a wedding belt or sash. 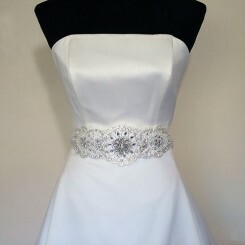 A slinky lace wedding gown can be customized with a beautiful bridal belt – see the Charlotte Balbier CB55 over the exquisite lace Yolanda from Charlotte’s Iscoyd Park Collection. 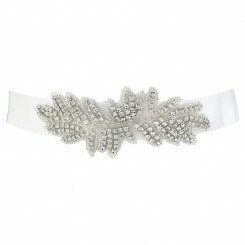 We carry a carefully selected range of wedding belts and sashes to suit all tastes and budgets including fantastic couture pieces featuring high quality Swarovski components, some exclusive to us in the UK.